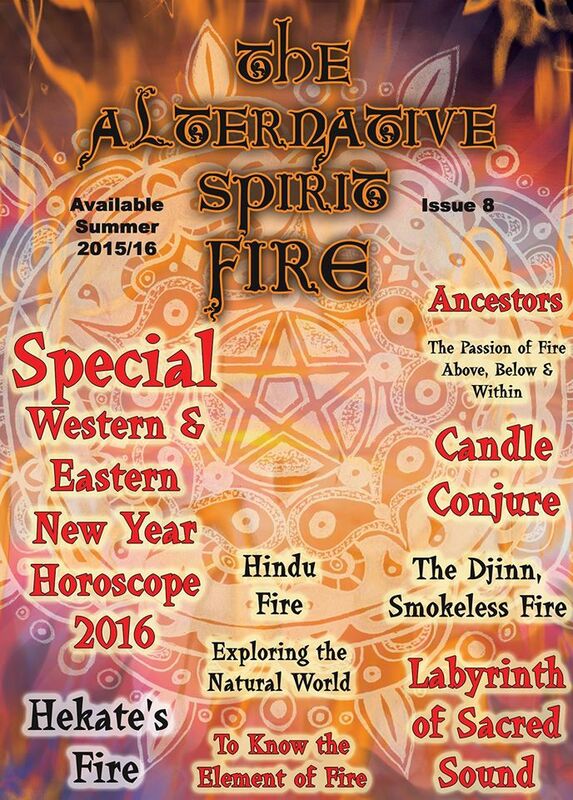 As the Executive Editor of Isis-Seshat journal, the quarterly publication of the worldwide Fellowship of Isis, I’ve decided that I want the Winter issue to focus on divination as the nexus of cultus, community, and culture. As the etymology of the word denotes, the purpose of divination is to reveal “the will of the Gods.” In our postmodern Western societies, of course, the concept has largely been divorced from its polytheistic impetus and has become co-opted by (or, if you prefer, degraded to) a secularist impulse for “fortune-telling,” largely for its entertainment value. On the 30th November 2012, The Sanctuary of Hekate’s Crossroads which was formed by myself as Torchbearer within the Covenant of Hekate was sanctified through the completion of the Sanctuary Consecration Rite The day was chosen due to it being the sacred day of Hekate at the Crossroads and my sanctuary having a connection to this sacred day due to its namesake made it the perfect time for this divine rite. In preparation of my Sanctuary Consecration Rite I had abstained from animals products the week before and fasted on the day with purified water being the only thing consumed before the ritual itself. Other preparations had been made during the weeks and days proceeding the ritual which included: sourcing wonderful organic produce from a local farmers market in the form of honeycomb, almonds, olive oil, rock salt, and milk, obtaining the black pillar bees wax candle from a local candle maker (which I had embellished with a flaming key I had specially procured from an overseas trip and surrounded by 3 handcrafted modern coins of Hekate which were gifts to the sanctuary along with a silver coronet which has a crescent moon as the centrepiece), the making of an authentic Hekate incense recipe from late antiquity, crafting the shrine cloth which included several types of white material (one of which I would go on to make a dancing veil in honour of Hekate after the rite), making and baking honey and olive oil infused fresh Greek country bread, extracting and steeping rose water from my home own grown roses, creating a necklace made for the Goddess which contained symbolism of all her realms, collecting flowers from my garden in the form of blossoming sage, blossoming balm of Gilead and calendulas which were in season and a three foot in length piece of red wool thread which I had embellished with some sequences. 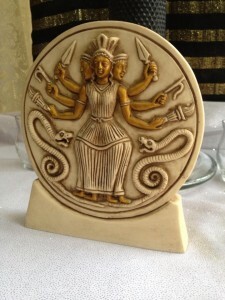 Pride of pace and the icon of Hekate used for The Sanctuary of Hekate’s Crossroads was one of the first images of Hekate I had received when I first started to pay honour to Hekate and was gifted to me by a long term friend and student which had been appropriately cleansed before the sanctuary consecration rite. Along with my icon of Hekate I also had other gifts of a flower etched glass container given to me by my godparent, a copper cauldron from my partner and my ritualistic bulleen I gifted myself due to the deepening herb, plant and tree crafting I have been refining since Hekate entered my life. 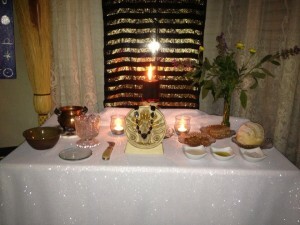 The ritual commenced after the shrine had been properly prepared by the establishment of sacred space, which was followed by a declaration of the ritual intent. Then the ritual proceeded as per Sorita’s instructions detailed in the rite itself. 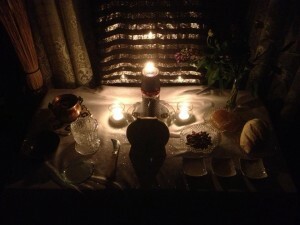 The atmosphere was electric when Hekate’s hymns were spoken, whilst much energy was raised during the sing song chanting in Hekate’s name and the ceremonial movements, acts and words were enacted which resonated a strong power, soared through my heart and vibrated right down though to my bones. After the Consecration Rite the Hellenic outdoor brazier which a member of the sanctuary and dear friend had hand made was lit in Honour of Hekate’s light coming into my life and showing me the way which contained environmentally sourced firewood from the tree of eucalyptus and herbs of bay laurel, rosemary and wormwood which I had collected and dried from my own garden. Also after the rite was complete a feast of thyme infused roasted lamb, herbed fish, garlic potatoes, Greek village salad, Greek country bread and a local red wine was partaken in and enjoyed. The next morning during my morning rites on Hekate’s Chthonic earthly shrine I discovered that in my garden several of the Californian poppies I had planted during a previous ritual to Hekate had blossomed as well as many of the plants and herbs dedicated to Hekate seemed to have bloomed for the first time or appeared in the height of bloom and radiated a wonderful glow. I thank Hekate for her wonderful blessings and I look forward to continuing to serve as her Torchbearer within the Sanctuary of Hekate’s Crossroads (COH) and as her Priestess within the Hekate Community as a whole. 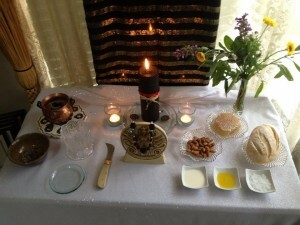 Set up altar: image of Hekate, khernips, khernips bowl, khernips towel, offerings including: flowers, grape juice, blessing cups, libation vessel, olive oil, candle to Hekate, candles for attendees, incense, charcoal, incense burner, amphiphon, bay leaves, matches, barley and gifts to attendees (coins and pendants). Each participant should wash their hands in the khernips which is placed in a bowl outside the sacred space. Tina to take barley and throw the offering of cleansing upon the shrine and upon the sacred space and say “Hekas hekas este o-bebeloi” (Afar, Afar, O The/Ye Profane). All gathered are to form a formal procession and walk towards the sacred space carrying the offerings with them. All are to present the offerings to the Goddesses by holding them up in a gesture of offering and place them on the altar before forming a semi-circle around the altar. You do not need to speak to do this but may say a few words as a statement of purpose if you are inspired. 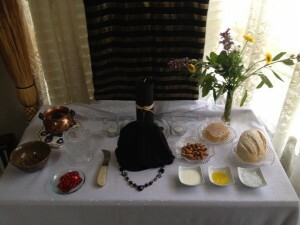 Tina to sprinkle khernips over offerings to purify them with the words “Xerniptosai” (be purified). I am a student of your mysteries. 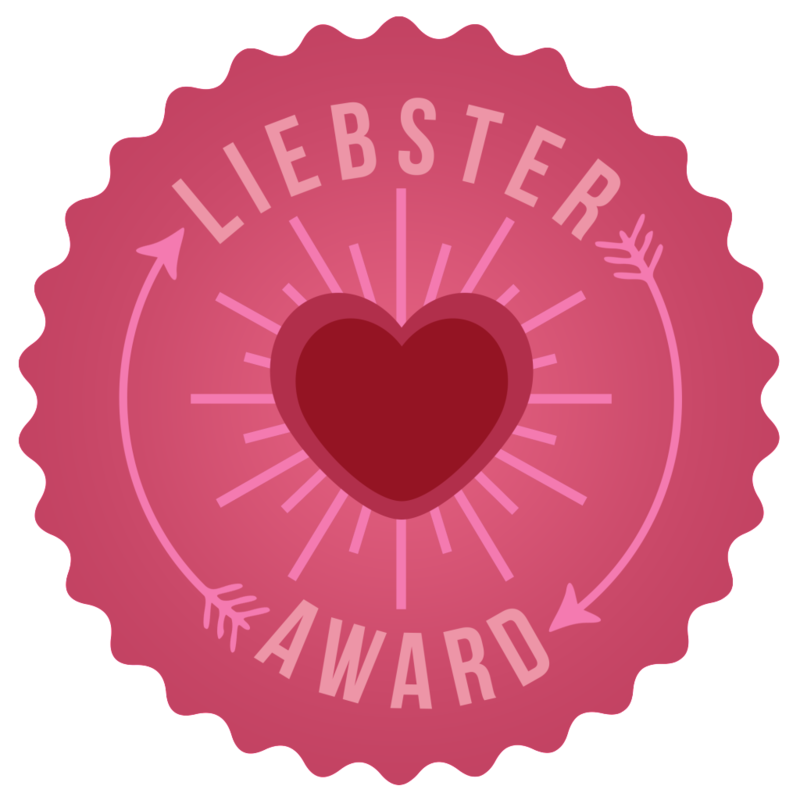 Extinguish the flame, then place both your hands on your heart (three heartbeats), your forefinger and middle finger of your dominant hand to your lips (three heartbeats), and then to your brow (three heartbeats). 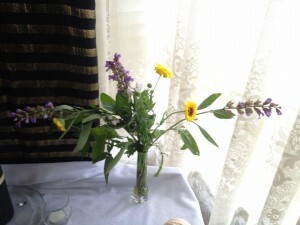 Attendees may now proceed before the altar in turn and present any offerings they have. These can be in the form of items lifted up to the heavens, in the form of hymns or prayers they would like to read out to Hekate, any petitions of askance, blessings or the like and lastly any jewellery or ritual tools may be consecrated using the khernips. Tina to pour a libation for Hekate. Tina to pour the rest of the grape juice into the cups provided and pass the cups to all attendees who may partake of it. 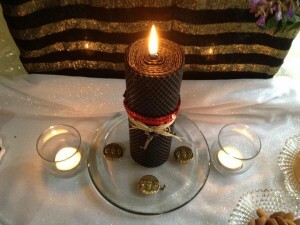 Tina to light the candles of the amphiphon (if the weather permits) and offer a slice to Hekate. Tina to share the rest of the amphiphon with the attendees who wish to partake of it. 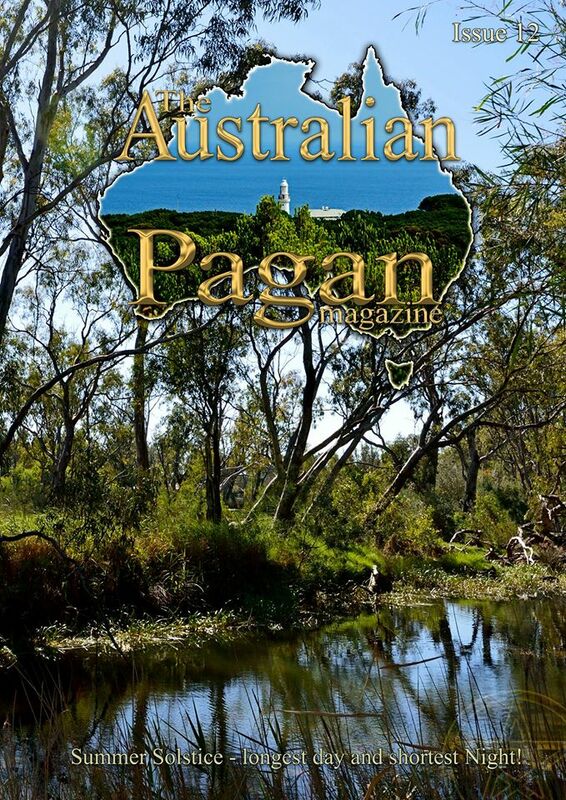 For those interested the “feasting” part of the ritual will now take place across the road at the Sandy Pub after the altar is disassembled and cleaned up. 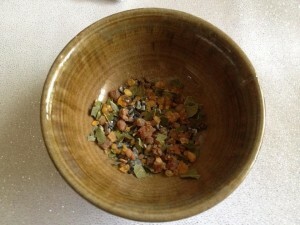 Re-read Dion Fortune’s “Sea Priestess” and was inspired to create an incense blend. 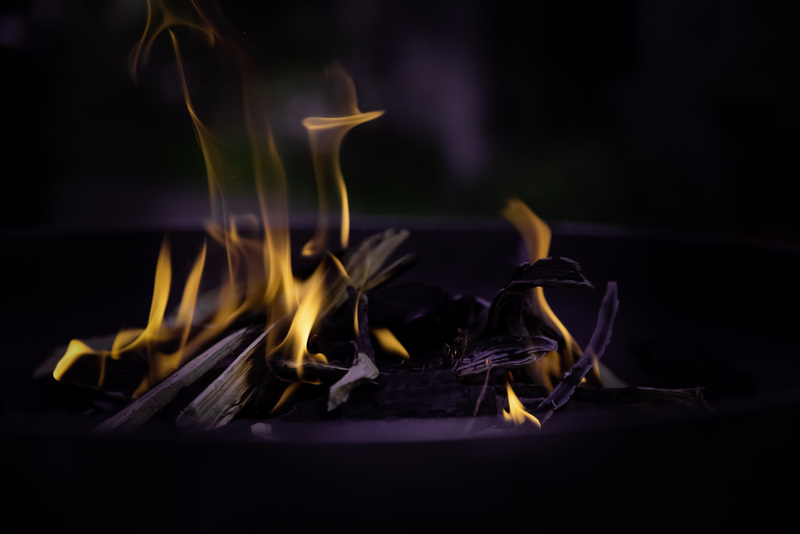 In the book a fire is built containing the wood of Juniper, Cedar and Sandalwood and as the fire tempers, the lit up ashes are used to bring on visions. This fire is called the Fire of Azrael and is used for scrying. You can do the same with ground up equal parts of juniper, cedar and sandlewood and use it as incense. 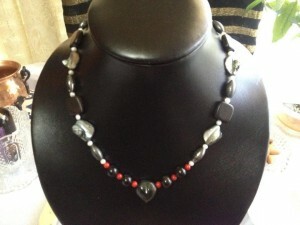 Inhale the fumes when you throw a pinch or two onto a burning chacoal block and utilize the smoke to scry.